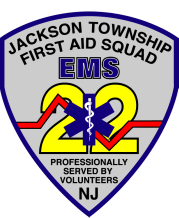 Established in 1953, the Jackson Township First Aid Squad is a volunteer-staffed EMS agency which provides 9-1-1 ambulance service to Jackson Township every evening between the hours of 6 pm and 5 am every day, 365 days a year. Every year the Squad answers approximately 2,000 calls for service, and transports more than 1,000 patients to area hospitals. A 501(c)(3) tax exempt, non-profit corporation. Many of the 70+ members of the Squad are New Jersey Department of Health certified Emergency Medical Technicians, who are fully qualified to provide basic life support services. Several members hold higher qualifications, including paramedics and nurses. The Squad's members staff five duty crews, which operate out of our building on East Veteran's Highway. During duty hours, two ambulances are continuously staffed to provide emergency response. The Squad's members together donate thousands of hours to serving the people of Jackson Township. On an annual basis, members respond to varied calls, from those requiring CPR, to motor vehicle crashes, to sick children, to fall victims. The Squad also provides mutual aid to surrounding towns, and supports Jackson's three fire districts by responding to fire calls to provide EMS support.